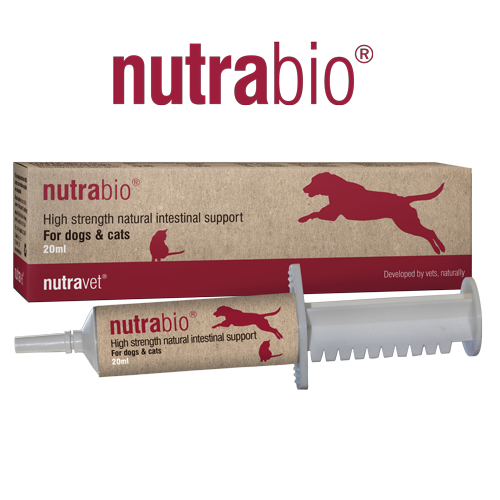 Probiotic (Enterococcus faecium) - The high strength nutrabio formula administers 4 billion Enterococcus faecium cells per 2ml notch to support the gut’s own healthy bacteria. Research has shown that Enterococcus faecium helps to normalise faecal consistency. Prebiotics (FOS and MOS) - Studies have shown that supplementing prebiotics such as Fructo-oligosaccharides (FOS) and Mannan-oligosaccharides (MOS) can increase the number of beneficial bacteria in the gut while blocking bad bacteria. Sweet Basil Extract - Unique to nutrabio, Sweet Basil Extract is a palatable ingredient that has several important effects on gastrointestinal health and digestive balance. Kaolin - Kaolin acts as an adsorbent. Adsorbents work by binding toxins and removing them from the gut. Kaolin also absorbs water helping to firm up loose stools. (Feed Materials/Additives): Enterococcus faecium DSM 10663 NCIMB 10415 (4b1707), 2 x1012 cfu/Kg, Sunflower and Canola Oil, Kaolin Clay 100g/Kg, Sweet Basil Extract, Fructo-oligosaccharides (FOS), Mannan-oligosaccharides (MOS) and Yeast Extract. 1) Check the required amount needed, each plunger notch administers 2ml of nutrabio. 3) Fold down the number of notches as required. 4) Push down the plunger and administer contents to animal’s feed, or directly into the animal’s mouth. Keep out of direct sunlight. Best before: See syringe label.